« Why do they bother? An important meeting was held on February 3rd, regarding the Gorgosaurus and plans to make a mold of it so casts can be made in the future. Much earlier, plans were to latex mold it but that has changed. Because the specimen is so spectacular it will be molded with a slow-setting high-quality silicone rubber. This rubber will be brushed on in a single thick coat of a depth of about .5-1 cm. It takes about 16 hours to cure. Then a rigid plastic support jacket will be made for the mold. The specimen had been prepared with the intention of a standard latex mold being made, so the silicone rubber was unexpected (but pleasant surprise). The silicone mold will be extremely high resolution. Because it takes 16 hours to set, the silicone moves into every nook and cranny. This means I have to be extra diligent now to find and eliminate every tiny crack or hole the silicone may penetrate into and where we don’t want it to go. Such holes and cracks are found visually with ambient light, but it really helps to use a bright light and move the light up and down above and to the side of the specimen. Doing this, one looks for “dark spots”. Is that dark spot a small safe undercut or an unwanted hole that needs to be filled? One walks around the jacket many times doing this, then repeats, but now walking the other direction. These circular walks are done at normal head height and crouched down at various levels. It looks silly and I am sure the museum visitors looking through the preparation lab window must think I am mad, but it needs to be done to find all the unwanted holes and cracks. 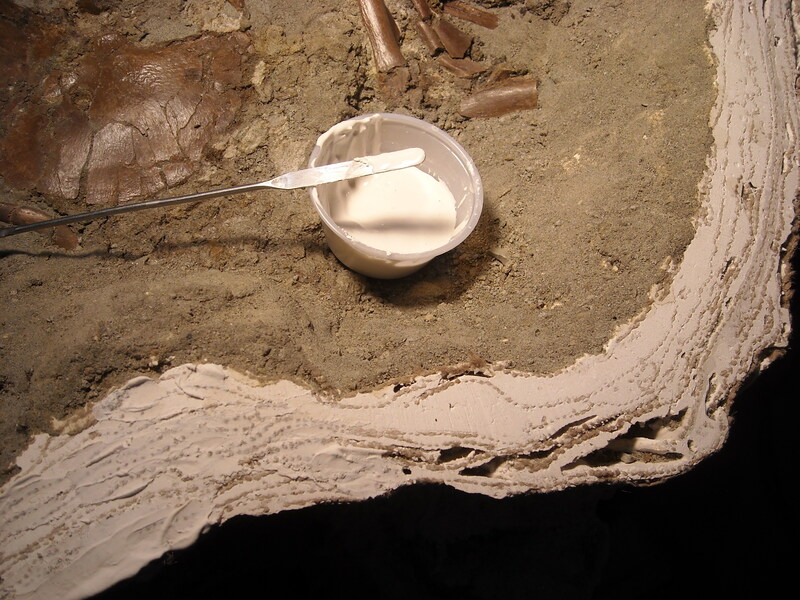 At the same meeting it was decided we will likely make a mold of the edges of the plaster field jacket at the same time- it makes for a nice “frame” around the skeleton. One cannot simply paint silicone rubber onto dry plaster. First the plaster jacket was patched. Wet plaster was smoothed into the holes and cracks with a small spatula. Then, once dry, that new plaster was sanded down with coarse drywall sandpaper. 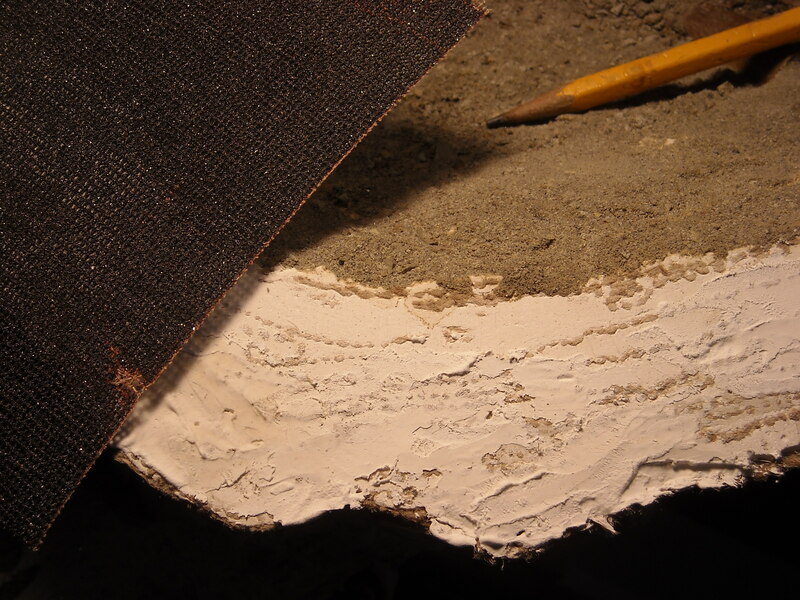 Then the fixed areas were vacuumed to remove all dust, and then a couple coats of acryloid glue (medium thickness) was painted onto the exposed plaster. 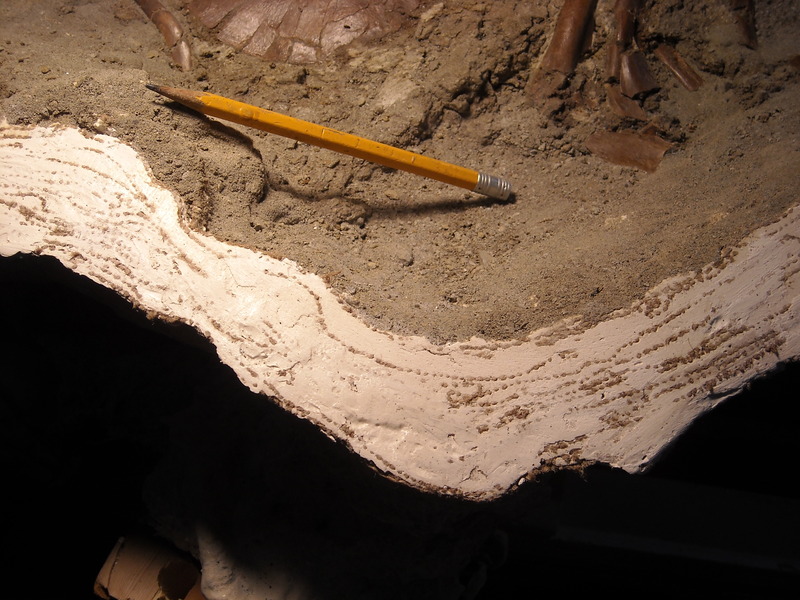 The small brown “dots” that you can see in the last plaster jacket photo is the cross-sections of the individual burlap fibres in the woven sheets used to make the field jacket. 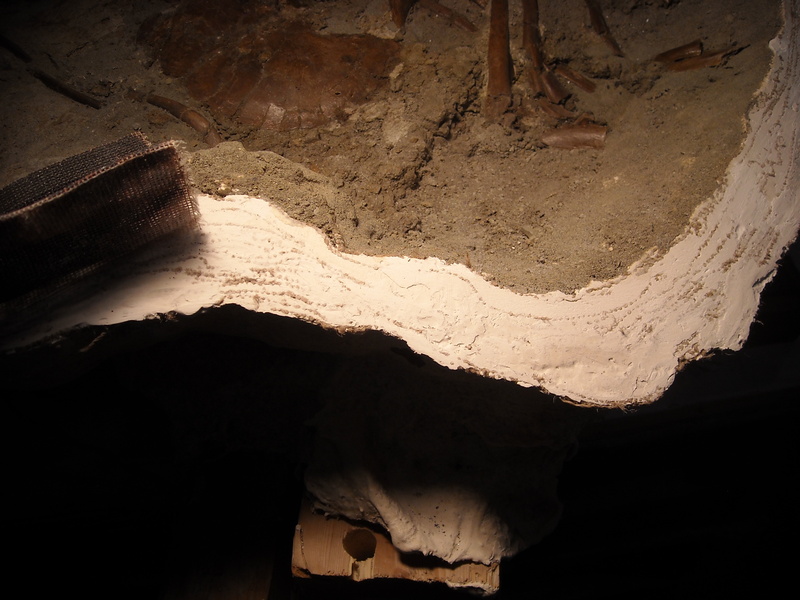 None of this plaster fixing work has to look pretty, it just has to last long enough for the mold to be made. At the same meeting one of the scientists wanted the orbit (eye socket) highlighted a bit better. This meant having to undo some of the work I did months ago. This is no big deal and actually welcomed as I was able, by digging down through my prior work, to see how well (or not) my preparation and gluing work has suceeded. All had held together OK, but I discovered a new crack inside the orbit that was not visible previously. This was fixed and restored as per prior updates. 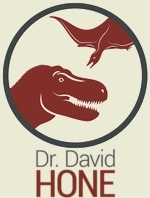 Dr. Philip Currie is visiting our museum February 18th and see the Gorgosaurus for the first time- I will have the specimen ready for molding by then. How the mold is made will be shown in future updates. Thanks again Darren (and Dave). This is a great series of posts. I hope you remember to tie your boot laces correctly when you’re on public view! (Cross-posting here) Being asked to waste valuable drinking water would’ve been the last straw for me. I might have assaulted that person. It was the last straw for me. Then and there I decided never to do fake stuff for film crews again. Glad you are enjoying the series. I can’t wait to get the skeleton flipped over and see how complete the skull is on the other side, as well as some other things of interest. 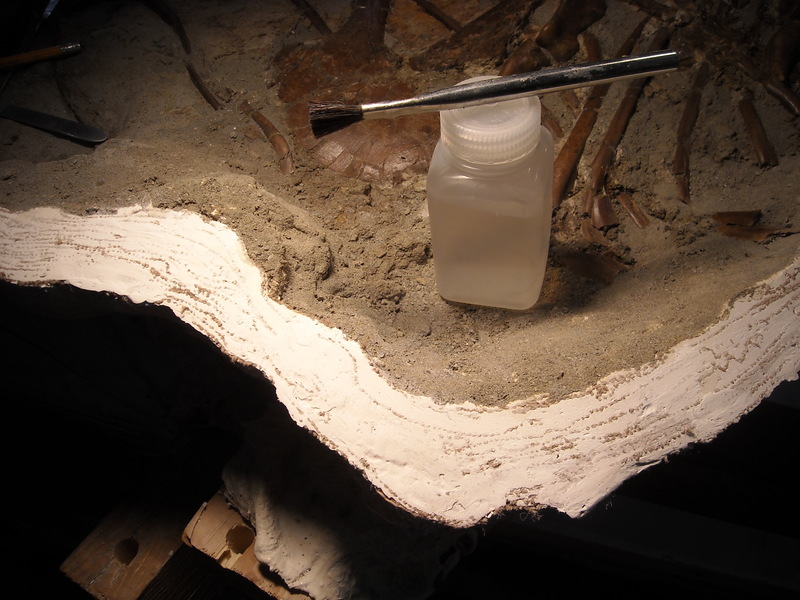 Many many thanks for all these posts and for the huge amount of information about vertebrate fossil preparation, very few persons are ready to share his work step by step with so much detail.